Hosting Solutions Review 2019: Is Hosting Solutions a Good Hosting? 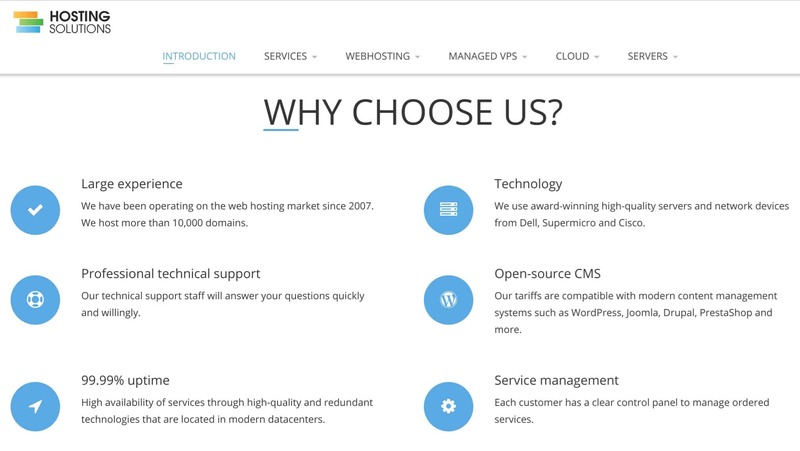 For above-average CMS hosting at below-average prices, it’s worth checking out Czech company Hosting Solutions. Founded in 2003 and located in Prague, Czech company Hosting Solutions provides shared Linux, VPS, cloud, and managed server hosting as well as domain registration. It uses redundant server hardware in high-availability clusters for increased stability. Hosting Solutions’ data centers are located in Prague, Czech Republic, and Rome, Italy. Its website is in Czech. Hosting Solutions offers several different types of hosting, including WordPress and CMS hosting, VPS, cloud, and server plans– both managed and unmanaged. Starting out with the CMS Hosting MINI plan, you get hosting for one domain, 5 GB of SSD storage, 10 databases, and a free Let’s Encrypt SSL certificate. The full CMS Hosting plan gives you 10 GB of SSD storage and 20 databases. If you’re planning on using WordPress, you’ll be interested in the WordPress Toolkit that simplifies the WordPress setup by automatically installing the software, setting up a database, creating an admin account, and then initializing the site. You can create a staging environment to work on the website before going live, and you can manage multiple instances of WordPress simultaneously. For higher traffic websites requiring more resources, Hosting Solutions offers managed cloud hosting plans that start with two CPUs, 4 GB RAM, and 40 GB of SSD storage. The hardware incorporates Intel Xeon processors set up in a redundant high availability cluster mode. The majority of Hosting Solutions’ services are delivered from a modern data center in Prague. This facility features optimal thermal conditions and a stable power supply, and it has multiple backbone connections controlled by an autonomous, redundant network. Security systems use cameras, and precautions are in place for fire and loss of electricity. Pricing for Hosting Solutions’ web hosting plans starts with the CMS Hosting MINI plan that costs less than a cup of coffee per month and has enough data and features for a simple WordPress website. The regular CMS Hosting plan doubles the amount of storage and databases for about 2.5x the price. This second plan is approximately half the cost of the average European or North American web host. Hosting Solutions’ plans can be purchased quarterly, biannually, or annually. There is no discount for longer-term commitments, so the lower-commitment quarterly plan costs the same price per month as the annual plan. Even if you do opt for an annual plan, the 14-day money-back guarantee should get you out if anything goes wrong within the first two weeks. Oh, and at the time of writing this review, there was a 30%-off promotion for the first billing period for new customers. You won’t be supporting yourself with this hosting provider because its knowledge base is virtually non-existent. Hosting Solutions offers affordable CMS, VPS, and server website hosting from a modern data center in Prague. Plans are priced below the international average, and they come with a free SSL certificate. 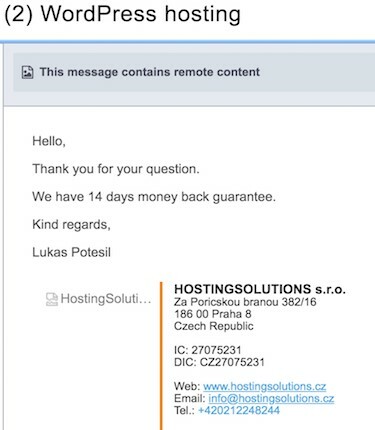 There are flexible hosting term lengths, and you get a 14-day money back guarantee to get you out if anything goes wrong. Wondering how Hosting Solutions stacks up against other Web Hosting companies? Enter any other Web Hosting company and we will give you a side-by-side comparison.